At the end of this week, John Stark, General Manager of KLCC, Eugene, will hang up his radio spurs after more than four decades of public radio service. Stark is a member of public radio’s Greatest Generation – the men and women who built a unique system of noncommercial radio that is now a valued public service in American democracy. KLCC has begun the search for a new General Manager (scroll down for complete information) but no one will really replace John Stark. His career is not only remarkable for its contributions to the communities where he work, Stark is an excellent radio broadcaster. Stark comment: Three of us in the photo went on to be public radio general managers and all three are retiring this year. I’m on the stairs, hands in my pockets, leather jacket. Max Wycisk was then our PD. He never left KCFR until his retirement in June. Max is on the left with long hair and beard. 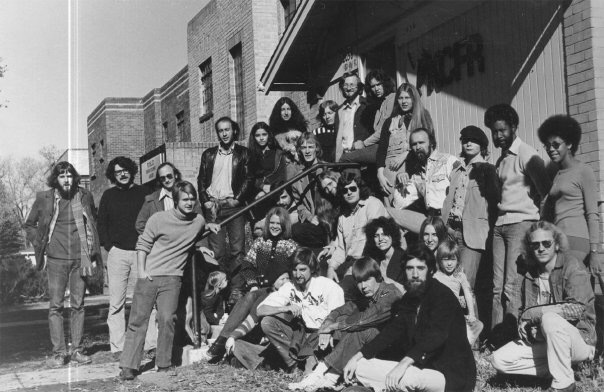 Marty Durlin, with dark hair kneeling in the second row, managed KGNU Boulder for 19 years, chaired the Pacifica Board, retires at the end of August as GM of the Moab, Utah NFCB station. Wayne Roth, then the GM of KCFR, took the picture. Stark has chosen his jobs wisely. At every stop he made the station better and knew the right time to move on. We first met when Stark was PD of KNPR in Las Vegas. KNPR, a community licensee was a recent start-up in a market where many people thought an NPR station wouldn’t work. Las Vegas then was a city where blackjack dealers made more money than teachers. KNPR was managed by Lamar Marchase, a relentless promoter who new his stuff. Stark programmed a non-cluttered air sound and KNPR thrived. In Flagstaff at KNAU he took a small rural station and turned it into a regional powerhouse. Stark built alliances with folks in Native communities and extended the reach of KNAU with a second program stream, repeater and translator stations. 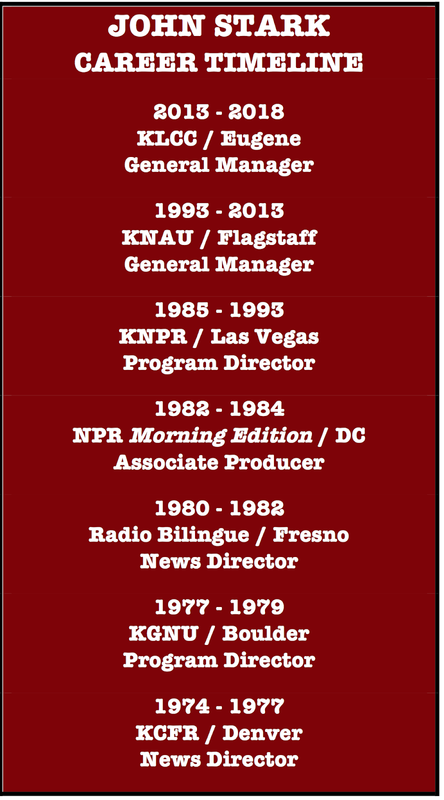 In a pattern he would duplicate in Eugene, Stark built a collaborative relationship with KJZZ in Phoenix. • KLCC has a strong 8.6 market share, number two 12+ in the market, perennially maintaining one of the highest public radio shares in the nation. 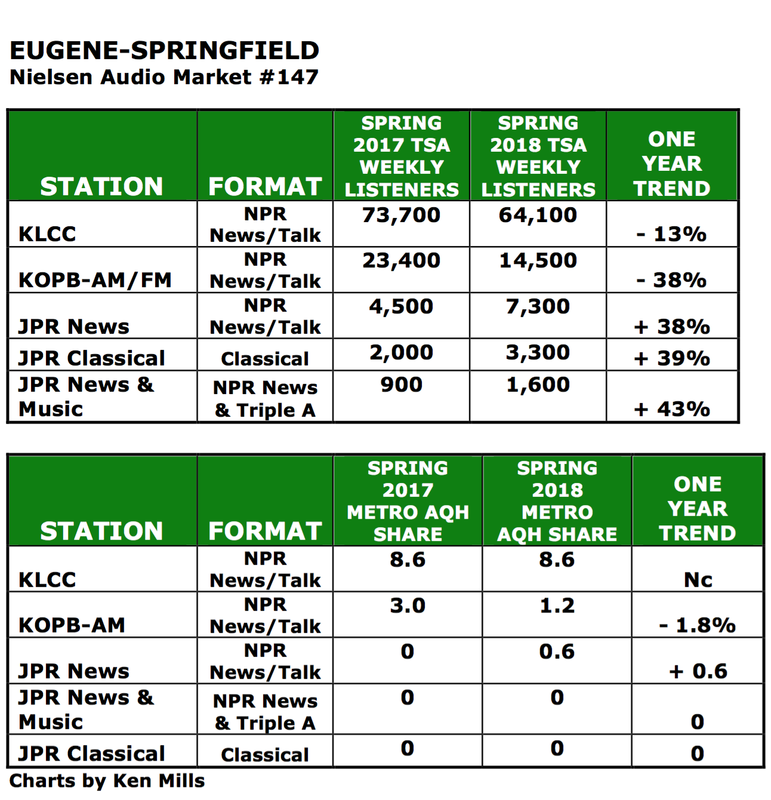 Eugene-Springfield is a public radio rich market, home to three CPB qualified stations: KLCC, classical KWAX featuring Peter VandeGraff, and "Real Variety in Music" KRVM plus AM repeater stations for OPB and Jefferson Public Radio. 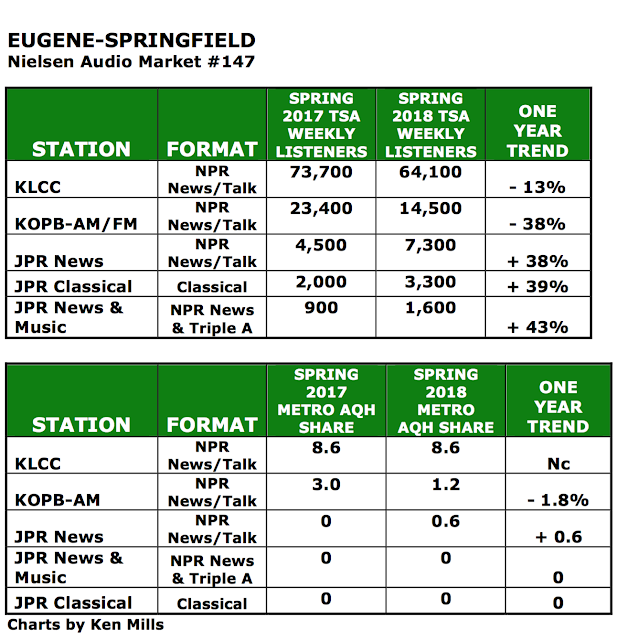 • KLCC's 8.6 share is greater than the aggregated shares of all the other public radio stations serving Eugene. That's because the home team always wins, "NPR For Oregonians" is a strong programming position, and FM trumps AM. • KLCC attributes its success to execution of a four-year strategic plan including news collaboration with OPB and Ashland's Jefferson Public Radio. KLCC carries OPB's midday news program "Think Out Loud" and airs stories from OPB reporters everyday in newscasts. KEN SAYS: On the right is a comparison of KLCC’s and KOPB’s schedule during the prime listening hours. Stark’s plan was brilliant and simple. He put a lot of KOPB’s best programming on KLCC. 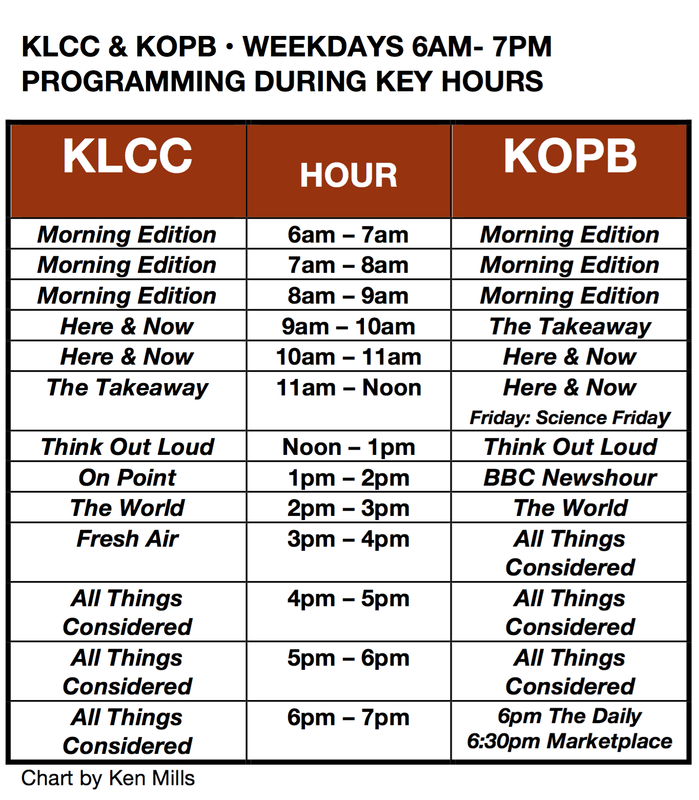 As we said above, KLCC had been countering KOPB by airing different programs. That caused many people to tune to KOPB for NPR shows. When Stark put his plan in action, KLCC added KOPB’s signature program – Think Out Loud – to KLCC’s schedule. Many of the best public radio news programs air on KOPB and KLCC at the same time. What Stark did with these changes was eliminate the reasons listeners had to were tune out KLCC and they came back to KOPB. WILL YOU BE THE NEXT GM AT KLCC? KLCC's future looks bright with the recent creation of the KLCC Public Radio Foundation, a 501c3 established to fund raise and advocate for the station. In its first year, the Foundation transferred $125,000 to KLCC and received multiple grants, including one that funds a Diversity Journalism Fellowship with a position now posted at klcc.org. KLCC is hiring both a GM and PD. 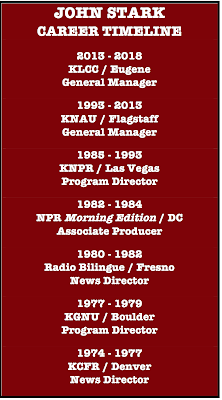 I'm retiring at the end of the month after 44 years, 7+ stations in public radio. 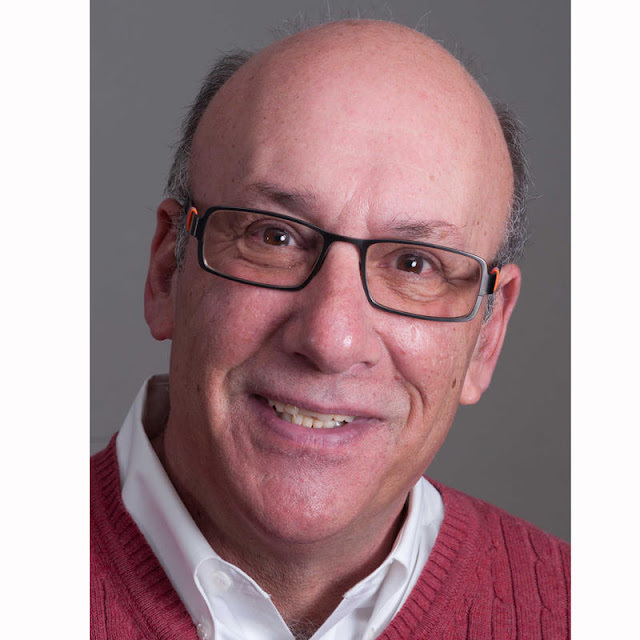 Former PD Terry Gildea left to become PRNDI's first executive director. Searches for both positions conducted by Livingston Associates with September 9th closings. Thank you for writing this piece. John has been a transformative leader for KLCC and positioned the station for continued success.